La Bloga: Teaching the Chicana and Chicano "Body"
Reporting from Lincoln, Nebraska where I’m shaping, creating, organizing my Chicana and Chicano literature class that begins in a couple of weeks. There are so many great books to teach. This year, I’m also going to include a section on the Chicana and Chicano “body”— a look at our dietary history, how modernity has produced foods that cause illness, and an invitation to return to some of the indigenous Mexican foods that heal and strengthen the body. 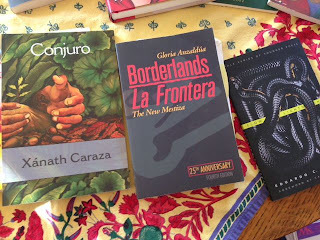 I’ll introduce the food section when we read Gloria Anzaldúa’s Borderlands/La Frontera because even though her book is not specifically about food, it is about returning—returning, re-evaluating, reclaiming our past to merge what is best of both the past and present in order to create a healthier/stronger present consciousness. This November, I’ll be joining Dr. Luz Calvo (California State University, East Bay) and Dr. Catriona Esquibel (San Francisco State University) with the amazing poet, Ire’ne Lara Silva (author of “Furia”), on a panel regarding food and nutrition. (Click here for El Mundo Zurdo conference information). Professors Calvo and Esquibel have been teaching their students how to “decolonize” their diets. They have created a “Decolonize Your Diet” website (click here!). In Ethnic Studies, we think a lot about what is knowledge, who holds knowledge, what kind of knowledge is valued. How can we, as people of color, look at the knowledge we hold collectively and validate it? Food is a very easy way into this conversation, as everybody has stories about food; everybody has foods that they like. Because we are so colonized and because my students, especially, are living a lot on fast food and really cheap food, it provides a way to open up conversations about the impact of capitalism and consumerism on our bodies and communities. We also talk about how we can recover some of the ancestral knowledge that people hold in their immediate families. It’s pretty cool to get students to realize that maybe their great-greandmother has the key to our people’s survival and health. Maybe this great-grandmother knows more than some big professor at Harvard. It’s good for student’s self-esteem, in a certain kind of way. To validate that their families hold this knowledge. It’s also a good horizontal teaching method, rather than me being the holder of the knowledge, I facilitate the sharing of knowledge. Also, something I’ve been thinking about a lot—what kind of education and knowledge is valuable to have? As we go deeper into this global economic crisis, it’s actually some of these older, traditional ways of knowing how to survive at a really basic level that are going to be critical. For me personally, I’m trying to get up to speed. I now know how to garden, grow my own food, prepare it, and store it. Those are the skills that are going to be helpful for us to survive as a people going forward. I’m looking forward to sharing our food knowledge in my Chicana and Chicano literature class while also reading Anzaldúa, Eden Torres, Manuel Muñoz, Sandra Cisneros, Américo Paredes, María Amparo Ruiz de Burton, the poetry of Xanath Caraza, Eduardo Corral, Ire’ne Silva, etc. So many writers! Reading, discussing, writing, trying new foods and recipes—I can’t wait! And speaking of food and gardening, last week I posted a picture of a volunteer plant that appeared in a corner of my garden and has spread out to various sections of my backyard. At first I thought it was zucchini. But it’s not. I have a pumpkin patch with one pumpkin growing happily! Amazing. My volunteer pumpkin patch with growing pumpkin! As well I have a very healthy corn plant, lovely basil, a ton of very healthy kale, broccoli, cherry tomatoes, and poblano chiles. It’s been a great season due to the cooler weather in Nebraska this year. More gente are learning how to garden and eat the food they grow. Another “La Bloga” writer, Michael Sedano, is a gardener and foodie. He often showcases some of his recipes on his Tuesday blogs. We are recognizing that fast food, processed food is making us ill and the only way to combat this colonizing of our diet is to feed ourselves. I spent about $12.00 on little tiny kale shoots that have just burst out into huge lovely plants. I’m saving a lot of money on greens with this kale and it is so healthy. There are also many Mexican grocery stores in town (yes, here in Lincoln, Nebraska—the Midwest—we have a number of Mexican grocery stores and really delicious and authentic Mexican restaurants) where I can get cactus and my favorite dessert fruit: tamarindo. Tamarindo: For a great sweet and sour treat (and very low carbohydrate count), consider the tamarindo. Usually people have had tamarind (English) or tamarindo (Spanish) in drinks processed with a lot of sugar, etc. I invite you to eat it raw. That’s the best way. The tamarindo tree produces hundreds of pods. You peel the pod and find this delicious sticky fruit with the seeds inside. It’s delicious to chop up and add to salads or even yogurt. Just peel off the outer layer and eat! It’s sticky pulp is a rich source of non-starch polysaccharides or dietary-fiber . . .
Dietary fibers in the pulp bind to bile salts (produced from cholesterol) and decrease their re-absorption in the colon; thereby helping the excretion of “bad” or LDL cholesterol levels from the body. 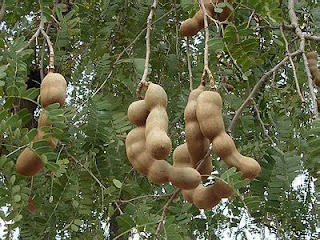 While lemon is composed of citric acid, tamarind is rich in tartaric acid. Tartaric acid gives a sour taste to food but is also a very powerful antioxidant. This prized spice is a good source of minerals like copper, potassium, calcium, iron, selenium, zinc, and magnesium. Tamarindo is also rich in many vital vitamins, including thiamin, vitamin A, folic acid, riboflavin, niacin, and vitamin-C. Much of these vitamins are antioxidants, and co-factor functions for enzyme metabolism inside the body. I've already discussed cactus in an earlier posting, but I thought I'd remind again-- how important the cactus is in nutrition. 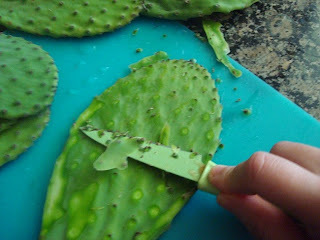 After you cut off the thorns and cut them up like this, then either stir fry or boil for just about 5-8mins. 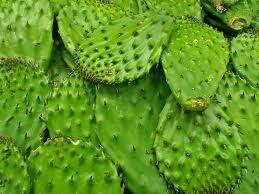 There are so many great ways to include cactus in your breakfast, lunch, or dinner dishes. You can mix it with eggs in the morning (like my grandmother used to do), add it into your salsa recipe, stir fry it with your main dish for dinner. The possibilities are endless and so delicious! Tepary beans soaking in water. Soak overnight and then cook! 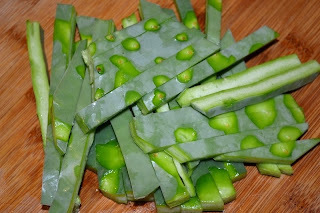 Another excellent food is the tepary bean. Out of all the beans we know, this bean has the lowest carbohydrate count. And it is an ancient bean. Read here all about the tepary: click here! 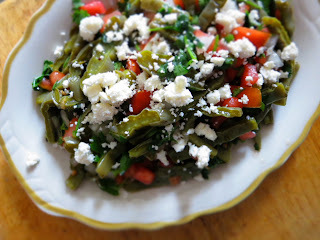 There are so many foods from our antepasado to recover and include in your dishes. I am wishing all of you a health-filled, delicious week! Enjoy! Thank you, Amelia, for this excellent article. I love the idea of decolonizing the diet! Your students are so lucky to have you to teach this class in Chican@ literature. A beautiful post, Amelia! Thank you for the gentle encouragement--both in the classroom and in the kitchen.